A troubling advertisement showed up on my Twitter feed this morning. It’s back-to-school time, and retailers are targeting parents (and children) with ads telling them what they must have to be prepared for a new school year. Walmart Canada’s ad promoted the social ill of overconsumption, which feeds the “fast fashion” trend. Like fast food, fast fashion is attractive to people who want to purchase a large quantity of a product for as little money as possible. But just as the fast food craze overlooks the consequences of overconsumption to health, the fast fashion trend overlooks the consequences to those in the fashion supply chain. 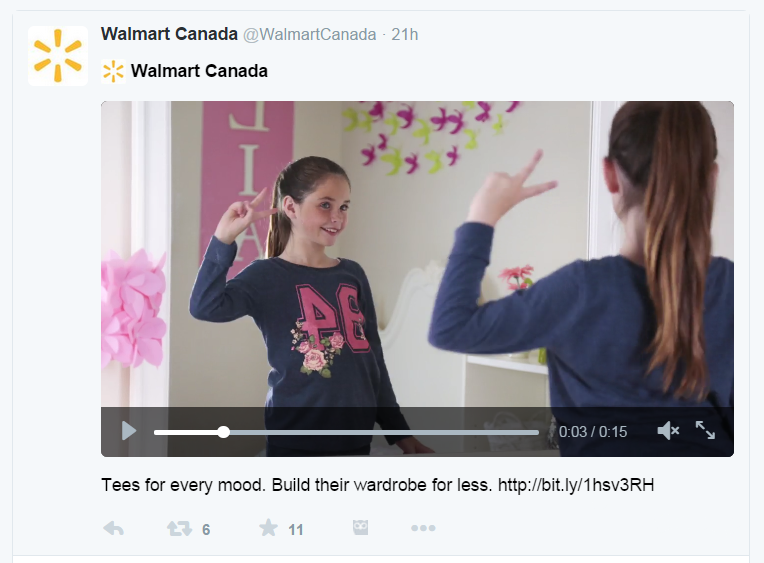 Walmart Canada thinks Canadian children need a lot of clothing – “tees for every mood.” Walmart’s child model had 10 moods (and 10 different t-shirts) in the 15-second commercial that confronted me on Twitter. Screen capture from Walmart Canada’s Twitter advertisement, 2 September 2015.